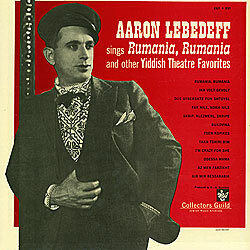 Notes One of the most cheerful and original personalities in Yiddish musical comedy was Aaron Lebedeff. He had a unique zest for improvisation, clowning and dancing. His singing was an amazing virtuoso exhibition, combining a beautiful lyric line, dizzying facility and rapidity of diction, and the throaty blues-moaning of the jazz singers of the thirties. And, yes, this album contains his famous, Rumania, Rumania.